"Husbands For Life" The Wedding of DAYS WilSon! – Watch The Promo! 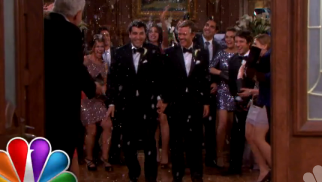 This week on Days of our Lives, it’s a very special three-episode event starting tomorrow as the NBC soap is marrying its first gay male couple, Will (Guy Wilson) and Sonny (Freddie Smith), in a ceremony in front of their family and friends! Will it go off without a hitch? Well, in atypical DAYS style from the looks of the video promo released this week from NBC, the guys make it all the way down the aisle white rice and all! Marlena (Deidre Hall) who is presiding over the ceremony pronounces Will and Sonny as “husbands for life”, and with that it looks like the celebration is ON! Watch the promo after the jump! Then, let us know, are you happy to know that Will and Sonny tie the knot? Or, were you hoping for a major wedding DAYSaster? Are you glad to know that in 2014 a daytime soap is acknowledging one of the social issues of our time, marriage equality? Comment below! Ecstatic! It’s about damn time, too!! Guy and Freddie are so good together! Days Of Our Lives cancelation date is set for January 9th 2015…i read its being replaced by a news magizine style show of all things! I hate to see it go but im grateful the show will still celebrate 50 years on the air! Im not really upset and no Days fan should be upset as well as long as they know its April Fools day today!!!…lmfao!!! Well I am glad they let them have their service in peace– I guess all the fireworks will happen at the reception, because it can’t be a DAYS wedding without something going awry. Still don’t like Guy as Will. Yes. Disastrous timing and recast! Simply Amazing! Thanks! DOOL for the strength and courage in airing perhaps the 1st ever male-male wedding on soaps (or any shows). This part of WilSon’s storyline should have been with Chandler! They totally messed that up with the recast!